I have just read the statement issued by your outfit, Amnesty International (AI) which will be discussed at the UN Human Rights Council Session in Geneva later this month. You know what Alex, I thought you guys had the gall and temerity to claim your moral right to make that statement on Sri Lanka when your Amnesty International abdicated that moral right long before you and John stretched your beggars’ palms last September to collect the $50,000 from the Canadian Tamil Congress (CTC) after the Walk-a-Thon event, and accepting the crown to be a spokesperson for their Eelam cause. Since then you have not let down your donors. It happened in 1975 when your outfit, Amnesty International, devoted a modest half page to Kampuchea in its annual report covering 1975, the year Phnom Penh fell to the Khymer Rouge. And we learn that your Secretary General sent a cable “expressing concern for civilians detained in areas of conflict”, while noting prudently those allegations of mass executions were based on “flimsy evidence and secondhand accounts.” This was when it was a known fact that nearly one-fifth of the population of Kampuchea were exterminated by the Khymer Rouge in the early 1970s. It was also interesting to note that Amnesty International sent a cable congratulating the new regime of Kampuchea on the “large national union without distinction of class, religious belief or political tendency” it had just proclaimed. This wasn’t surprising since Amnesty International’s principal co-founder, Lenin Prizeman Sean McBride, boasts in his autobiography of having been a professional revolutionary since his teens, and that AI also employed the leading Australian Communist, Professor Derek Roebuck, as head of its research department in London, who refused to heed the testimony of refugees from Communist countries. By the following year your Amnesty International had to deal with a barrage of press reports of mass executions based on accounts of Kampouchean refugees arriving in Thailand. And what did Amnesty International do? It remained skeptical. That’s how deplorable the Amnesty International rascals were then, and now the same Amnesty International is claiming its moral right to comment on Sri Lanka. What balderdash! What twaddle!! What fiddle-faddle!!! Your outfit, Amnesty International’s impartiality suffered a nasty blow in 1991, when your man in Ottawa told me in the presence of Sri Lanka’s High Commissioner that AI did take exception to Sri Lankan Government’s soldiers using excessive force on the Tamil Tigers. This was when these Tamil Tigers were given army training by Indira Gandhi’s India and knew how to shoot bullets to kill from sophisticated weapons bought from monies sent to them by the Canadian Tamil Diaspora, and blasting legs off soldiers with buried Johnny mines. My response to this human rights advocating fool was, “When your Tamil Tigers point the barrels of their Kalashnikovs at the hearts of my soldiers, I don’t expect them to point the barrels of their rifles at the knee-caps of your Tamil Tigers. It is a matter of survival man, who get’s the other guy first. This is now a conventional war and not a bunch of high school students fighting in the school backyards with catapults and stones.” I stopped my barrage at your man when the High Commissioner started kicking my foot under the table to silence me. And now I know why you had the gall and temerity to make that statement about Sri Lanka on the last five months of the 27 year long Tamil Tiger suicide bombing, hatchet hacking of innocent farmers, shooting at point blank range at 32 Buddhist novice monks and 700 surrendered policemen, War. They were all my Sinhalese people. And you are concerned about the last five months of this bloody war! Ha! What’s wrong with you guys at Amnesty International? Didn’t you like the ruthless Tamil Tiger terrorists being wiped out? It was around that time of my confrontation with your man in Ottawa that your outfit, Amnesty International suffered another fatal blow to show that you guys are from a good-for-nothing rogue outfit. That was when your outfit, Amnesty International, said that Iraqi soldiers had torn babies from their incubators in Kuwait and left them to die on the floor of the hospital’s neo-natal unit. And it was this Amnesty International statement that sealed the onslaught on Iraq in 1991. And, of course, the Kuwait government rewarded your outfit, Amnesty International, like what the Canadian Tamil Congress did last September, not with just $50,000 but with $500,000 for endorsing this pack of lies. This was a pariah thing to do, wasn’t it Alex? But then, I understand, your outfit Amnesty International has to survive and it needs the money by hook or by crook. So the question that is floating around the human rights wallahs is, “Who believes in the World’s self-appointed Human Rights Police, Amnesty International?” “Sweet Mother of Jesus, it is certainly not me” I hasten to say. Here is another instant that challenges your outfit, Amnesty International’s credibility. Its Mission statement states that AI core values is working towards “…the universality and indivisibility of human rights, impartiality and independence, and democracy and mutual respect.” Sounds genuine… sounds snow-white TIDE clean… sounds we are a bunch of saints! But hey, Alex, you guys may not be so saintly as you say you are in print, when you in particular as The Secretary General of Amnesty International Canada joined the NDP to bicycle the Channel 4 video “Sri Lanka’s Killing Fields” around Canada to undermine Sri Lanka’s human rights record, of a class act of liberating 294,000 Tamils who were herded like unwashed cattle for 30 months from the west coast to the east coast as a human shield by the Tamil Tigers. And giving back the right-to-life to 21 million of its peoples which had been hijacked for 27 years by eliminating the Tamil Tigers militarily on 19 May 2009. You may have thought that NDP stood for some women’s basketball team like, Nancy & Diane’s Players. You were wrong Alex. NDP stands for the New Democratic Party. It is a political party which is now the Opposition party in Canada’s parliament. It was the leader of the NDP , the late Jack Layton who called for and spear headed the Emergency Debate on Sri Lanka and stabbed Sri Lanka to the applause of the separatist Tamils who were sardine-packed in the gallery. I christened this debate as the, “Canadian Tamil-Blarney Gong Show”. And so it was. It was pathetic. It was sick. It was an extraordinary event that turned the Parliament Chambers into a Tamil Tiger den that evening. How disingenuous can you be working with the NDP, the political party whose leader Jack Layton compared the leader of the Tamil Tiger terrorists, Velupillai Parabhakaran to Nelson Mandela of South Africa in front of 10,000 Tamils during a Pongu Thamil event at Queens Park in Toronto. This guy was nuts. Further more, John Argue, Amnesty International’s Sri Lanka Coordinator, sat with the NDP Tamil MP, Rathika Sitsabaiesan when she decided to show the Channel 4 video Sri Lanka Killing Fields to a small audience to spit at Sri Lanka. And John calls himself as a ‘Friend of Sri Lanka”. That is stretching a spurious-fact a bit too much isn’t it? This is the woman who quite proudly identified herself with the Tamil Tigers when she gallantly had the Tamil Tiger flag exhibited on her Facebook page when she won the Scarborough-Rouge River riding. If one is judged by the company he or she keeps, by associating with a Tamil Tiger sympathizer, John Argue damned himself and became a suspect in the anti-Sri Lanka separatist Tamil campaign. He has no way to wiggle out of that negative predicament which he knowingly got into. Too bad because I liked the guy but I don’t trust him anymore. And this is the most hilarious part in Amnesty International Statement on Sri Lanka. Your statement says: “Amnesty International urges this team to pay particular attention to the independence of proposed implementing agencies”. Wow! Alex, you guys colonial arrogance and mentality are amazing and astounding. See who is talking. When your outfit, Amnesty International who has lost its ‘independence’ tainted by accepting funds from governments who are certainly not Sri Lanka friendly, from immense corporate-financier interests, entwined with political ideology and economics – Sri Lanka has every right to pooh-pooh at you and ask: “Who the Hell are You trying to prompt others to tell us how to run our country’s business, that would support the Tamil cause and geo-political interests, having garnished your palms with a $50,000 cheque from a group who have their separate state Eelam still in their minds. Just cut it Amnesty International and vamoose”. And you know as well as I know that that Eelam war was supported by Tamil Nadu (ask Jayalalitha, Karunanidhi), Britain (ask Keith Vaz, David Cameron & David Milliband), India (ask Sonia Gandhi), Norway (ask Eric Solheim), Canada (ask Jim Kaygiannis, Jean Chretien, Anne McLellan). And there are many other countries. Alex, so what I tell your outfit, AmNasty Intern-nonrational, is drop Sri Lanka from your agenda and get your monkey off her back. You have lost your moral right to talk of Sri Lanka when you did absolutely sweet nothing to save thousands of my Sinhalese people getting killed by these India trained and internationally funded Tamil Tiger terrorists. 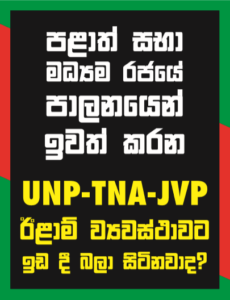 It is time that you and I have a public debate on your outfits moral right to harass Sri Lanka. I want this dearly.